I saw a meal like this on the ‘Stay at home Mum’ website and I was inspired to create something similar that was safe for our family. The biggest issue was the dairy – clearly cream of chicken soup is a no go in our house … so I’ve made up a replacement 🙂 It is basically a flavoured white sauce. Melt the butter in a saucepan and add the flour. Allow to cook out until frothy. 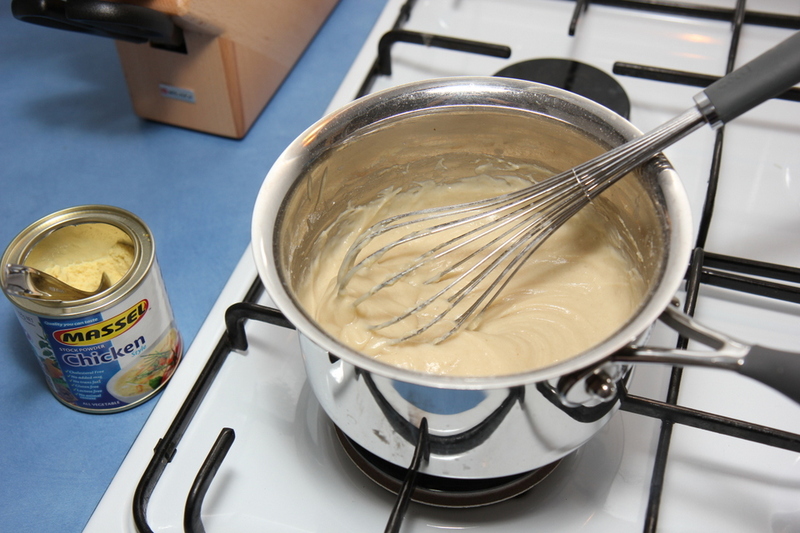 Using a whisk, mix well and continue to mix as you gradually add the milk. When the mix is smooth and thickening add the stock powder. Remove from the heat when it reaches the consistency of a tin of cream of chicken soup. It tastes very creamy and ‘chickeny’. *Update: To give this sauce an extra boost I have recently been adding about 1 cup of steamed pumpkin. Simply take about 1/2 a cup of the soup and blend it together with the pumpkin pieces, until smooth, then whisk back into the saucepan. 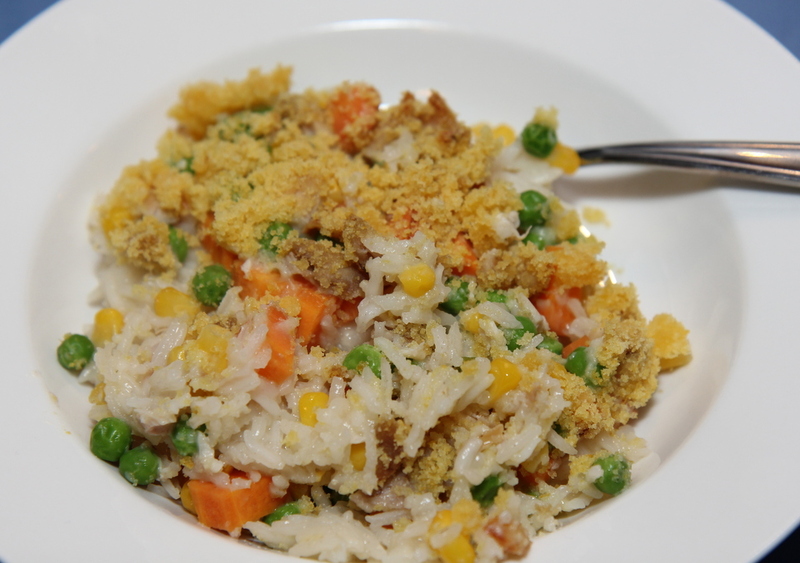 Cook the rice in a large saucepan – don’t let it get too soft as it still has more time in the oven. Drain the rice and return it to the saucepan. Add the veggies and chicken to the rice and stir to combine. Leave to the side. Leave the soup replacement in the saucepan where it was made, return it to a low heat and gradually add the chicken stock, whisking to keep it smooth. Allow to thicken a little, constantly stirring for a couple of minutes. Pour the stock and soup mix in to the rice saucepan and combine well. Pour the casserole in to a baking dish. Melt the butter in a separate dish, add the crumbs and yeast and mix until well combined and turned into a fine crumb. Sprinkle crumb mix over casserole. Bake in a preheated moderate oven until topping is golden and bubbling – about 35mins. Serves about 8 and freezes well. It was very well received in our house. Peter and I enjoyed it, Ellie polished off the whole bowl, Will had seconds and thirds and even Harry ate it with a bit of convincing (silly Mummy didn’t hide the yucky peas ;)). This is a pretty flexible dish. You can easily make it a vegan/vegetarian dish by removing the chicken. You could also add any veggies or left over meat you have, or even replace the rice with pasta.